The “wake up knock” comes on the Phantom Ranch women’s dorm door at 5:00am. I’ve signed up for the 5:30am early breakfast in order to get on the trail as early as possible. 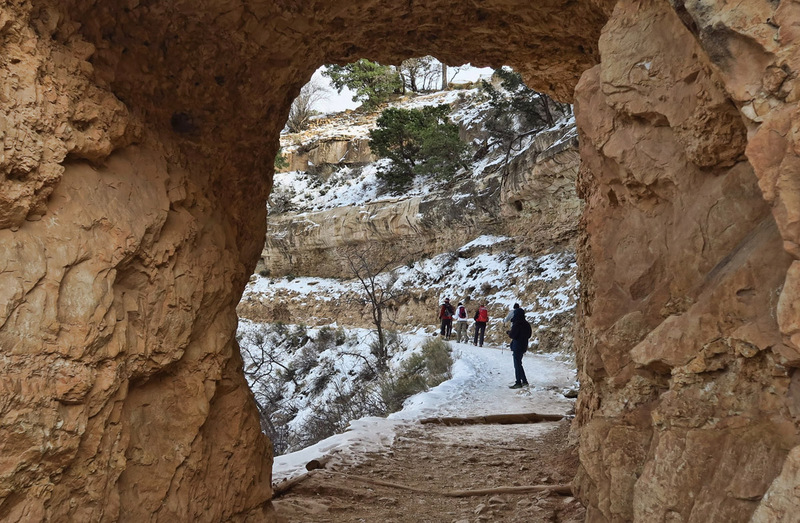 The sun doesn’t rise until 7:15, so this will mean hiking for about an hour in the dark, but I figure it’s better to put in the dark time at the bottom of the canyon rather than risk having to hike in the dark at the top where it’s covered in snow and ice. 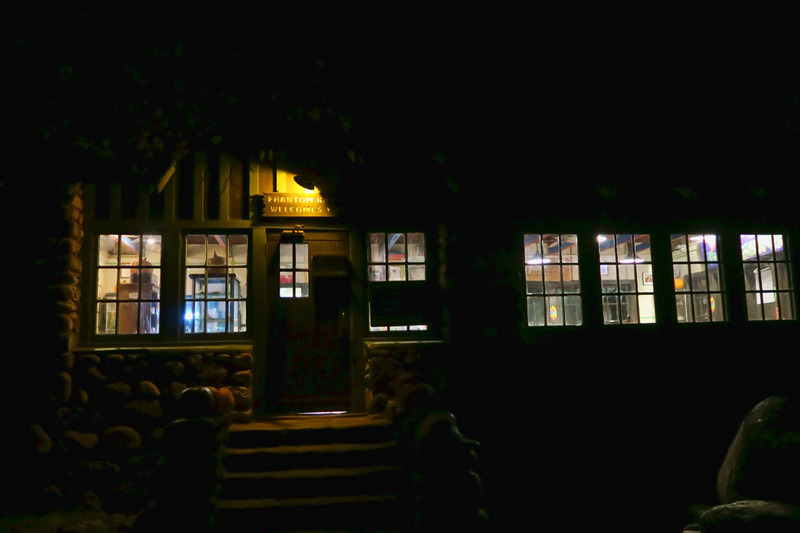 The Canteen in the cloak of darkness as I leave for the trail. 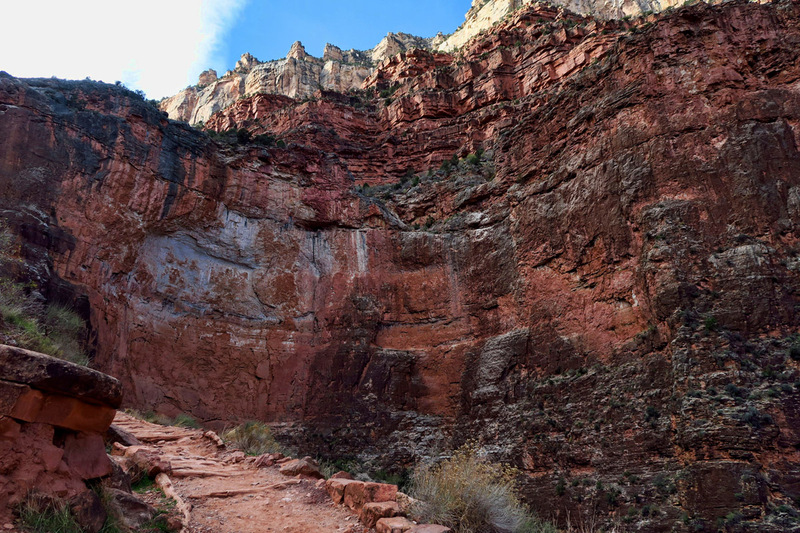 Crossing the “Silver Bridge,” not to be confused with the “Black Bridge” to the South Kaibab Trail. Silver Bridge also supports the Transcanyon water pipe. The tiny dot of a light at the left of the bridge is another hiker with a “miners” headlamp. 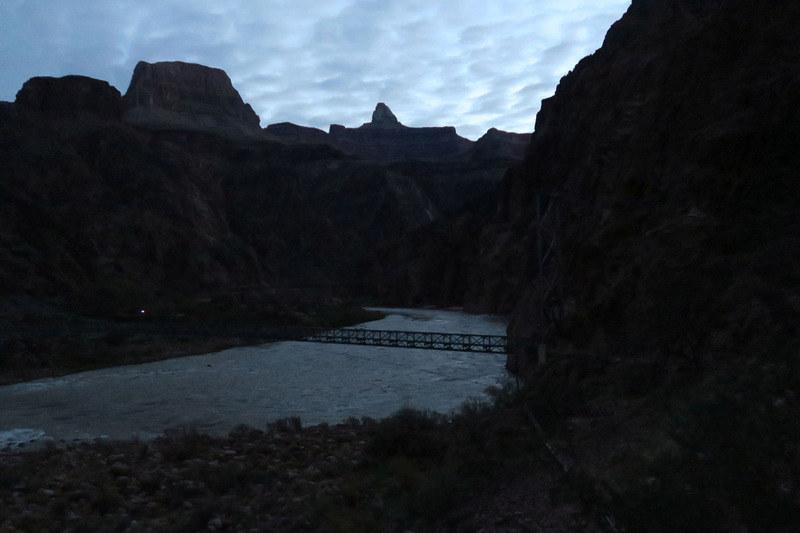 Looking back at the silver bridge, the sky begins to lighten. Turning away from the river at Pipe Spring, and 1.5 mile Resthouse. 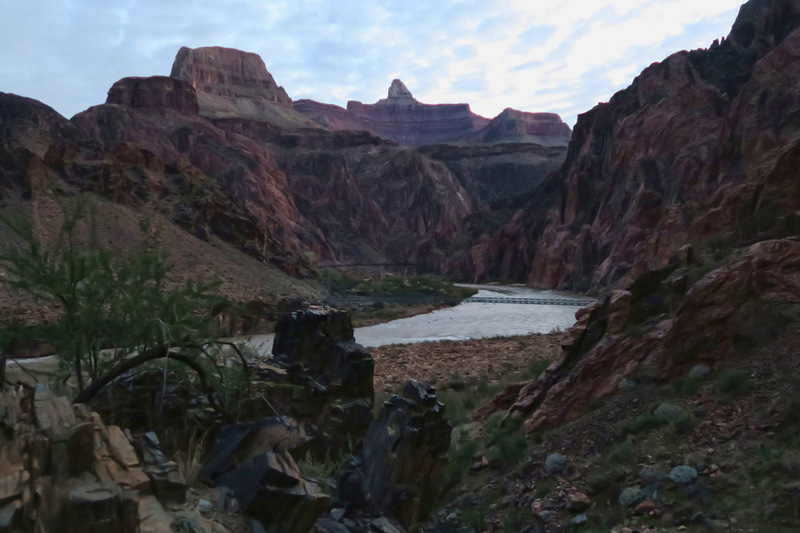 But as I lay there trying to wake up and get dressed for breakfast, I think about the speech the dining room attendants give at each mealtime…..how only 1% of the five million annual visitors to the Grand Canyon actually make it down to the river. This is a staggering statistic, and I begin to realize how privileged I am to have the wealth of good health to make this trip on my own two feet. 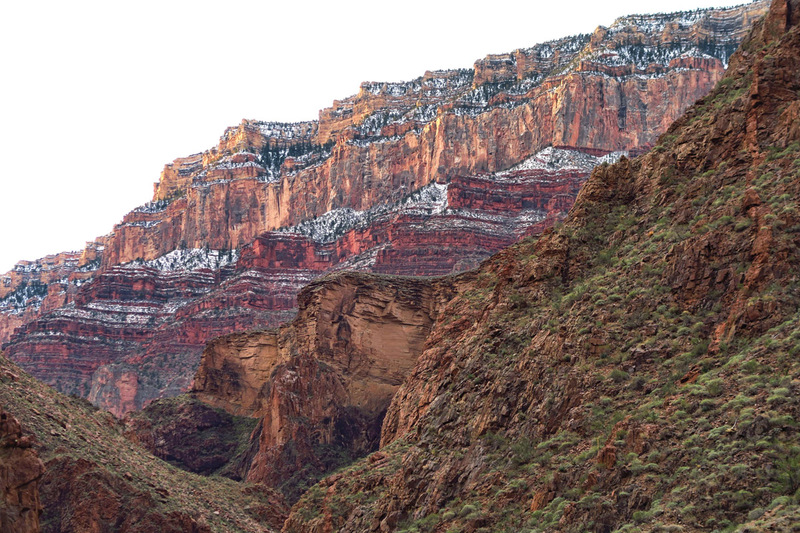 This is a bit of an epiphany at 5:00am, and I arise motivated and excited to make the climb out of the canyon. 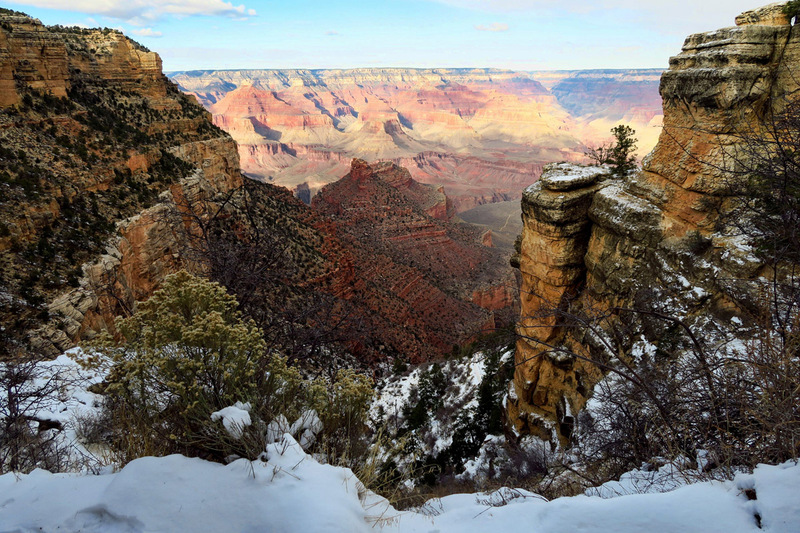 The sun has risen, and is casting a beautiful light on the rim. The Canteen feels electrified, filled with the buzz of energy of eager hikers. Breakfast is a feast of scrambled eggs, bacon, and pancakes. I’m not typically hungry so early of a morning, but I know I will need the fuel to not only keep me moving, but also keep me warm. It’s a brisk 25 degrees in the pre-dawn hour as we file out of the dining room, heavy boots echoing on the wooden floor and headlamp beams pointed toward the trail. 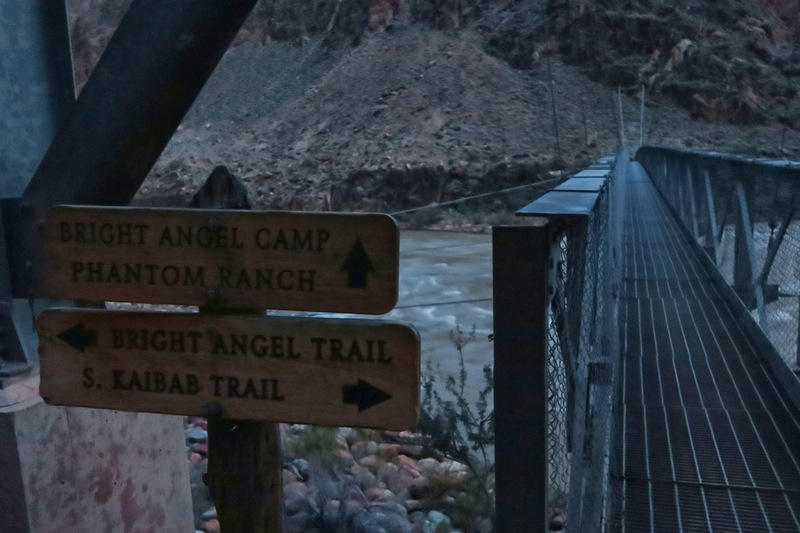 It’s still dark when I begin watching for the signs toward the Bright Angel Trail. I have my “miners” headlamp on, which illuminates the fog on my glasses caused from the vapor billowing upward as I exhale. It’s a bit eerie hiking alone in the dark, particularly after I unknowingly pass the mule pen, and one of the mules snorts, fluttering his nostrils, scaring what little daylights I had out of me. Leaving Indian Gardens. I was remiss in photographing the rest area….I think I was just too cold there in the shade, after having peeled off too many layers on the corkscrew climb. 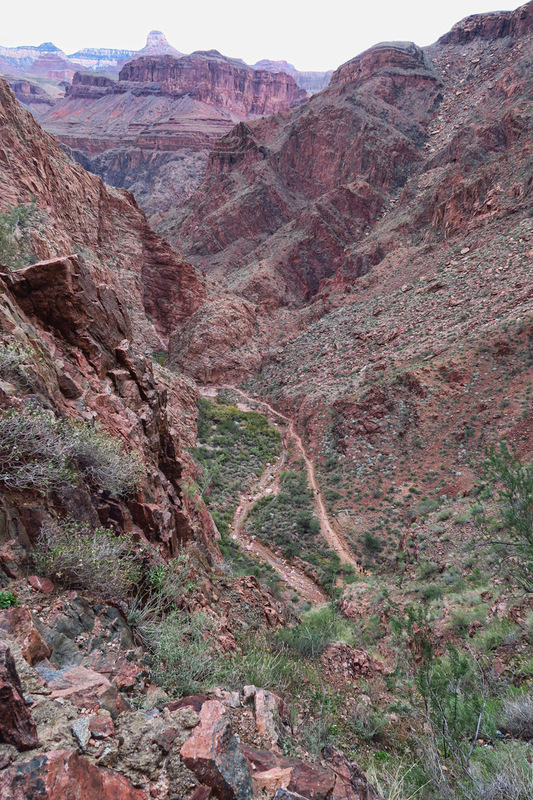 I did not anticipate the Bright Angel Trail to be so scenic. 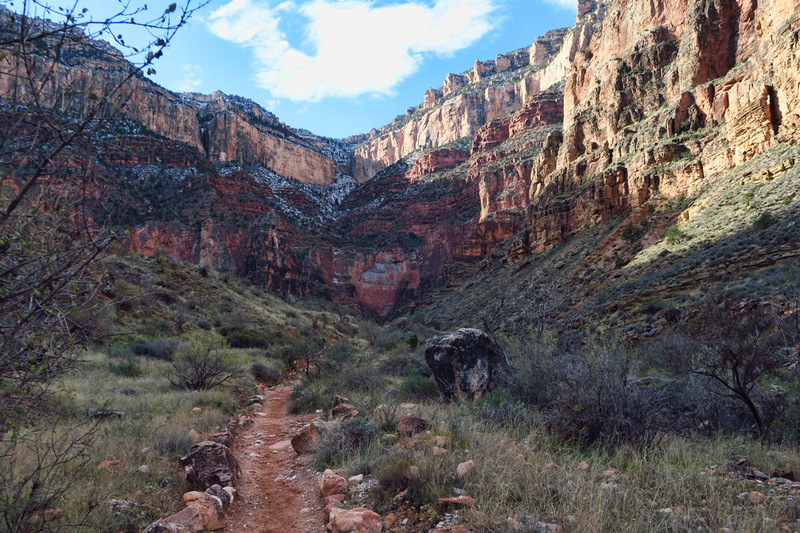 I’d read that it was a maintained dirt trail up a side canyon, used as the primary mule route, “graded for stock.” So I expected muddy switchbacks and a more limited views and sparse vegetation. 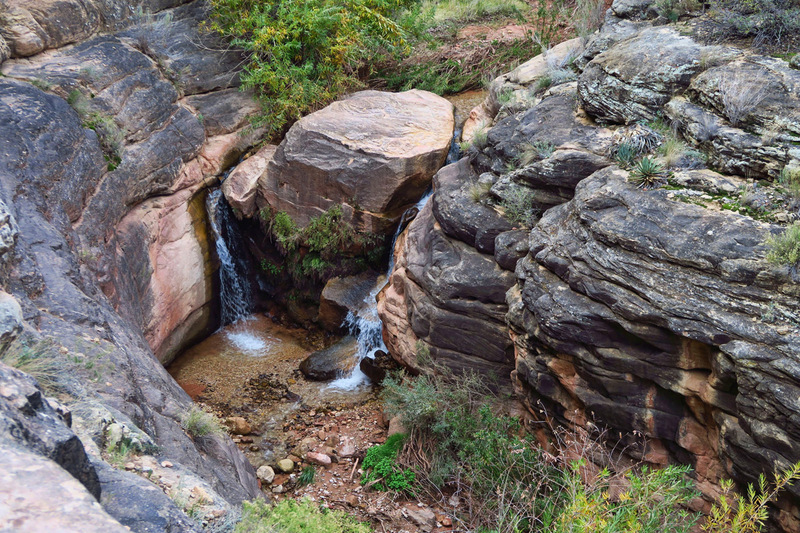 But hiking up through the Bright Angel Fault alongside a creek proves to be beautiful, and such a different scene than the South Kaibab trail. 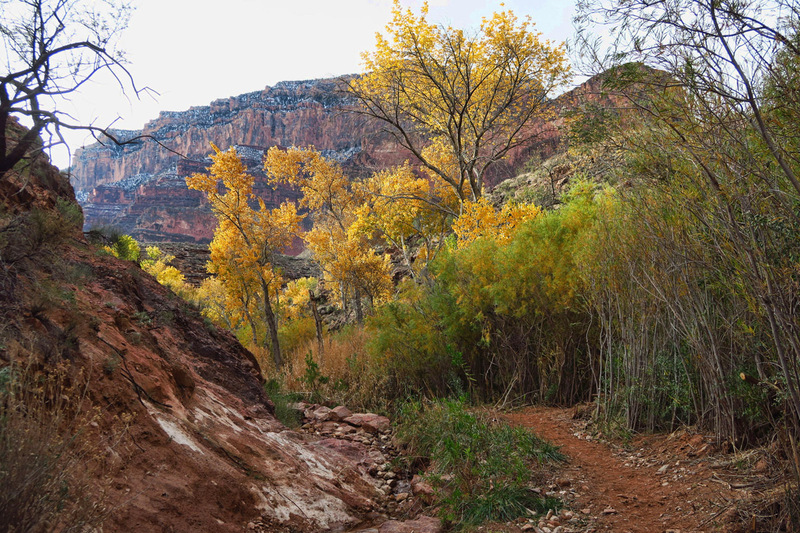 There are golden cottonwoods along the babbling brook, so seeing water and lush vegetation in tight, pancake-rock canyons is an inverted view to the wide open scenes from the South Kaibab ridgeline trail. But if you stop long enough to look behind you, the views are spectacular! 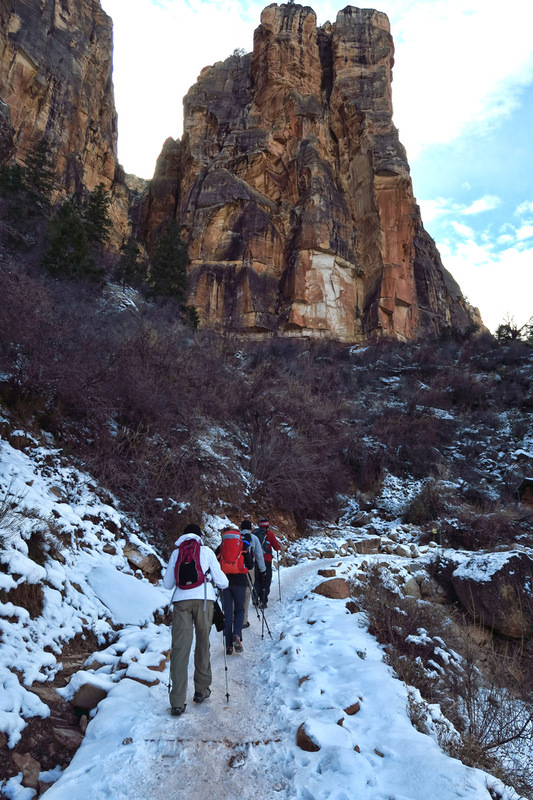 Another aspect that feels different on the hike up is camaraderie. 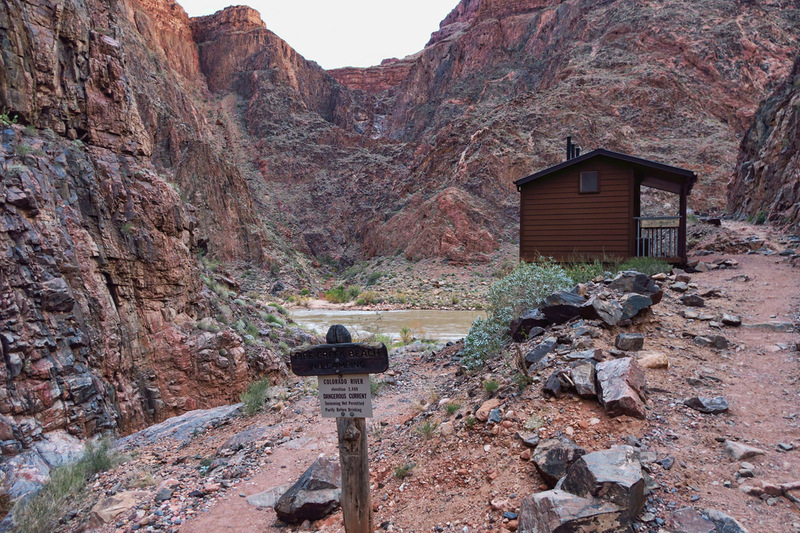 By the time I have spent two nights and four meals in Phantom Ranch, faces on the trail are familiar, while some have become friends. So even though I might be the “caboose” in the train, I still feel connected to those who started out from the same breakfast table. We meet up at all the rest stops comparing experiences, sharing food, and discussing the trail conditions ahead. Estimates of time of arrival and mileage still to hike. Layers of clothing donned at pre-dawn, shed and packed away mid-way, and now donned again. 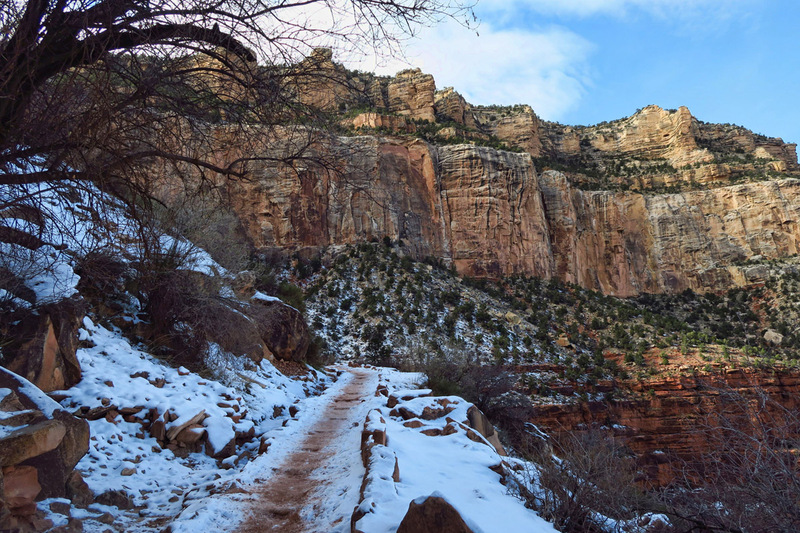 A full day hiking from dawn to dusk, from temperate to freezing, from sand to snow is an evolutionary experience, and I wish for a time-lapse video to show the variations. 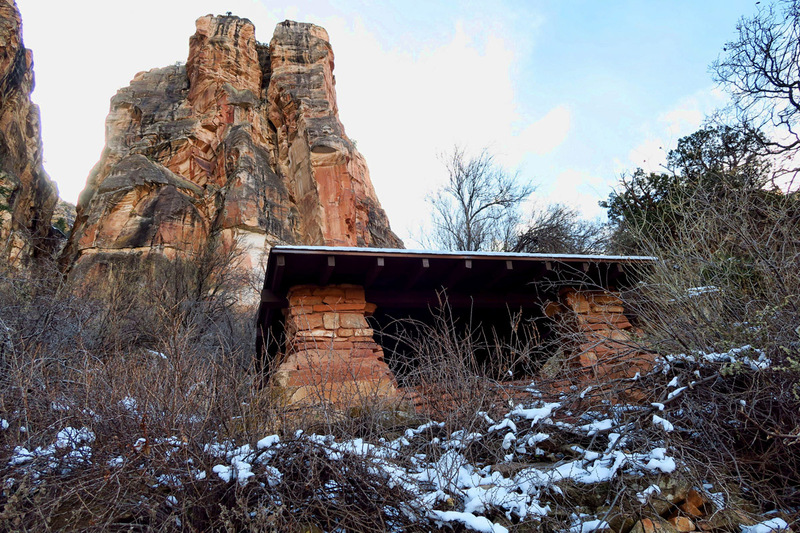 The covered Resthouse at the 1.5 mile mark. The scenery behind me is so different than the scenery in front of me! I catch up to my newly found friends at the halfway point, Indian Gardens. By this time, I have stripped down to a long sleeved shirt with the sleeves shoved up above my elbows. But Indian Gardens is a milestone of another sort. It’s cold here in the shade. Like shivering cold. Before I delve into my sack lunch, I layer up once again, and think back to my original plan to do this hike in June of 2015. Back in those planning stagest, my friend BJ advised that I wait out the mid-day here because of the cool shade and availability of water. I can see what a nice respite this must be from the intense summer heat. Almost done with the switchbacks! 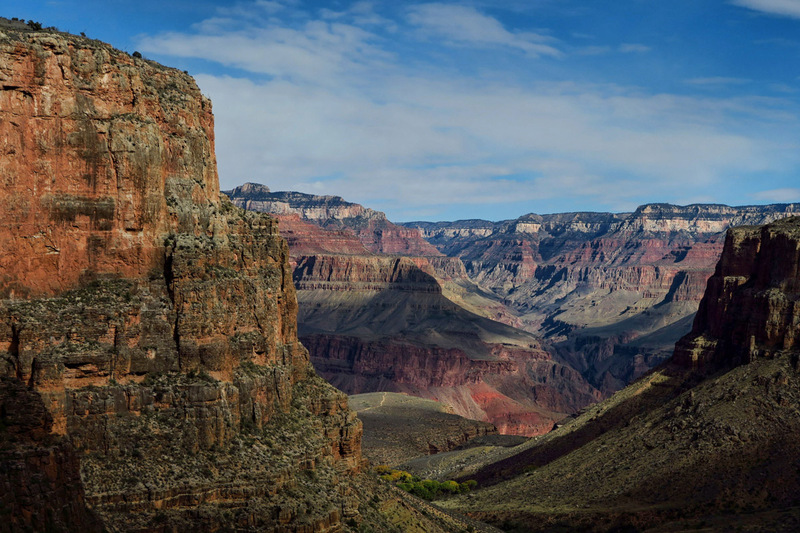 I read if one hikes from rim to rim, they have covered all the ecological life zones, the equivalent of going from from Canada to Mexico. 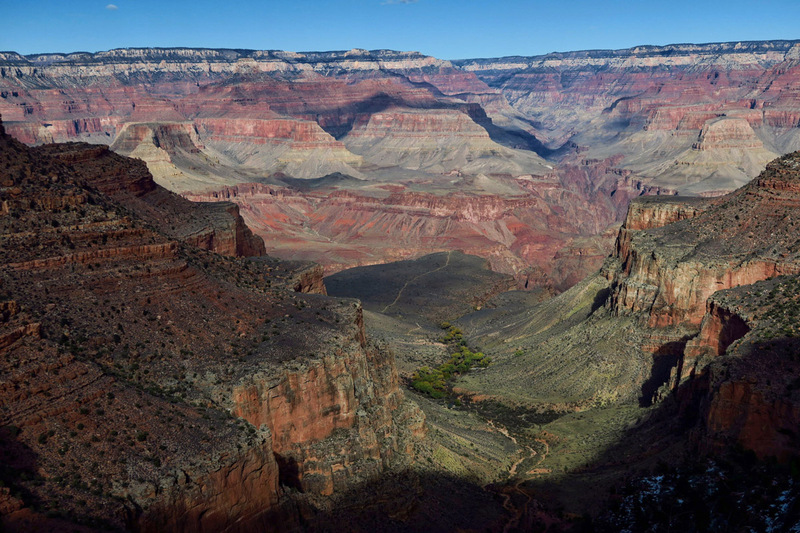 Geological descriptions talk in terms of “billions” of years accounted for in the multiple layers of rock, nearly forty different layers, from the 2-billion-year-old Vishnu Schist at the bottom of “The Box,” layer by layer, a mile up to the 230-million-year-old Kaibab Limestone on the Rim. 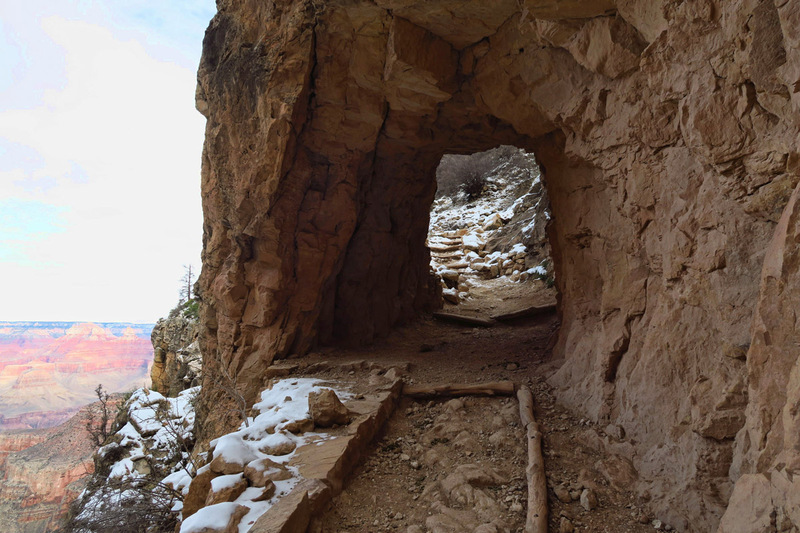 One of several “tunnels,” or holes carved in the rock to accommodate what was once a mining trail. The second half of the trail is definitely the steepest. 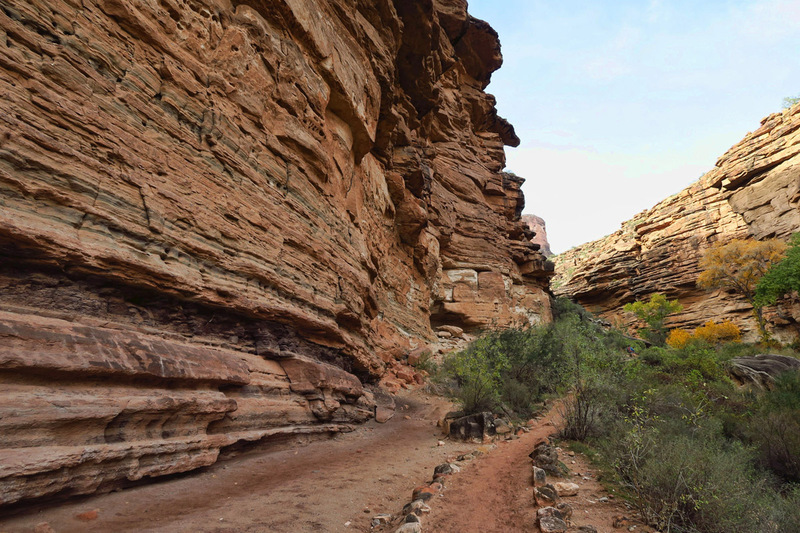 As the trail becomes more tedious, the switchbacks endless, I face the walls of the canyon head-on, staring them down with each turn. The milestones help give me a goal which I need mentally more than I do physically. I meet friends again at the Three Mile Resthouse and the 1.5 mile Resthouse. 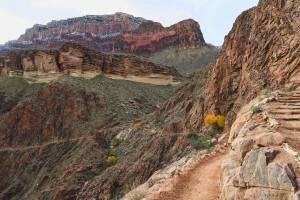 Conversation takes my mind off the monotony of the switchbacks, as does a fully charged ipod. 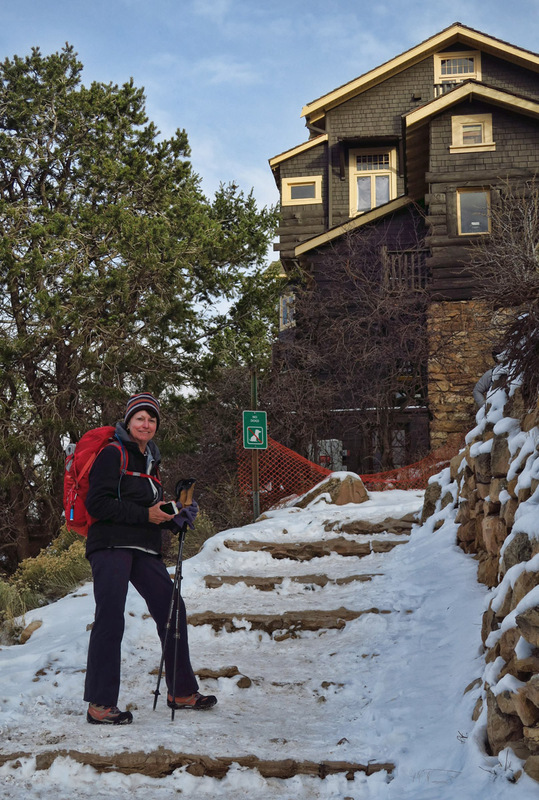 Char in front of Kolb Studio, which marks the end of the Bright Angel Trail. 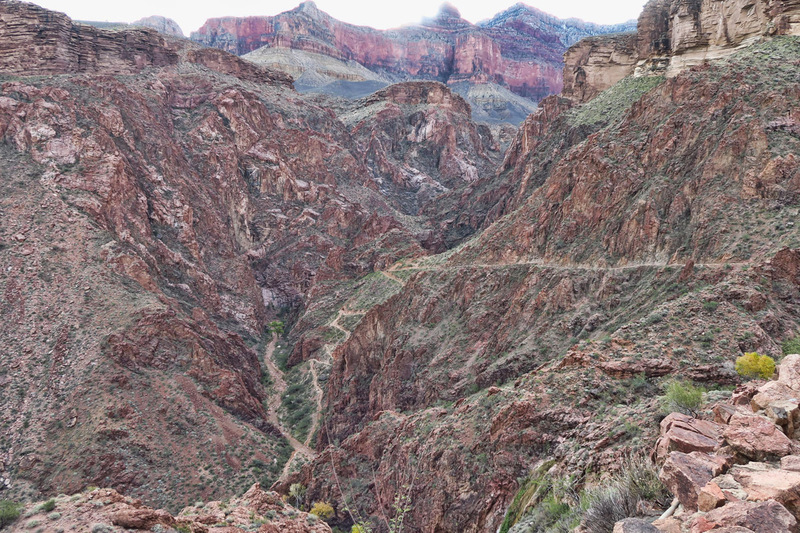 I know I’m getting near the top a half hour after I leave the 1.5 mile Resthouse, but it’s the first glimpse of the historic Kolb Studio, perched on the rim that tells me the end is near. It’s a sight that takes my breath away to realize not only have I made the 10 mile climb, a mile high before dark, but I am still smiling. I give my friends a hug goodbye at the rim, and head back to the Winnie, still parked in the Backcountry Information lot. A drop my bags and do a quick check to make sure everything is just as I left it, then head over to the Maswik Lodge a block away to have my way with a pizza and a cold draft beer! Finally at the Finish Line. Photo courtesy of my new friend Char. Three days ago, when I first arrived to the Backcountry Information Office, I read on an information board a phrase, “…you will be left with one of two reactions: either you will never hike again in your life, or you will find that your life up to this point has been meaningless and you will be forever enslaved by thoughts of returning to this torturous paradise.” I took a photo of the quote, wondering “which will it be for me?” Would I be enslaved with thoughts of returning? 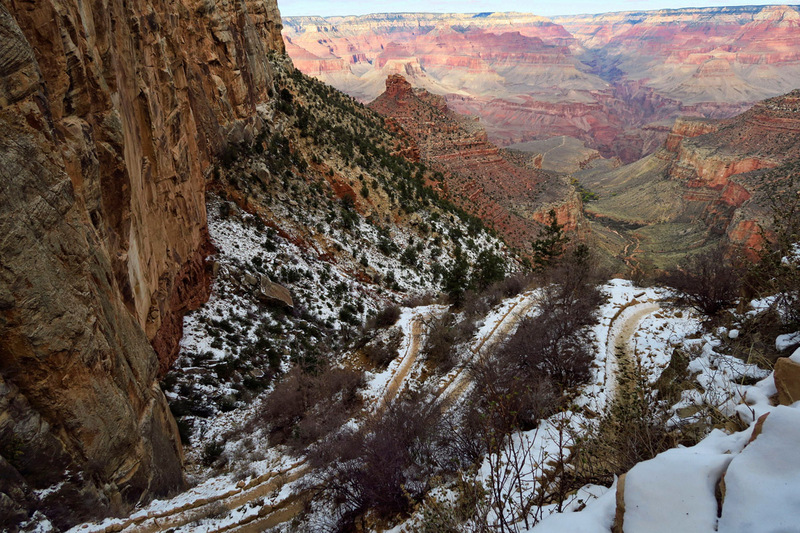 This entry was posted in Arizona, National Parks and tagged Bright Angel Trail, Grand Canyon National Park, Indian Gardens by Suzanne. Bookmark the permalink. Thank you Suzanne for those words and photos. Welcome to the club of the Forever Enslaved. Just beautiful! So happy for you that you finally got to do that hike. Whew, a saga! It could be a miniseries on HBO… or at the least, a documentary. Welcome to the privileged 1% Club. Also, you needn’t worry about the Circumferential Trail around Rainer. You got what it takes. Oh dear! reading the last phrase of your post I am afraid that I fall into the second group. Your Winter experience is so different from my warmer weather ones. 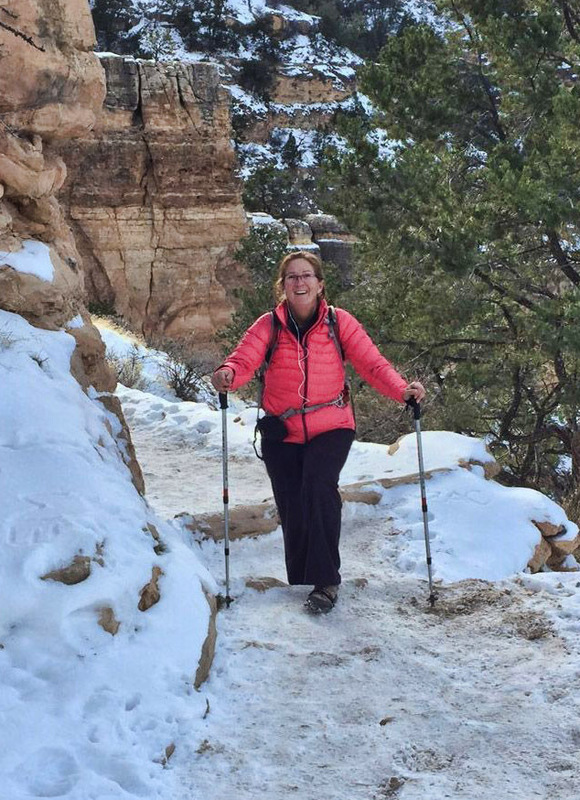 Seeing your last three posts I am already wondering about when I can do another canyon hike…….it has been calling me for years and I have visions of retiring on the South Rim and working in the gift store to make ends meet………sigh!!! 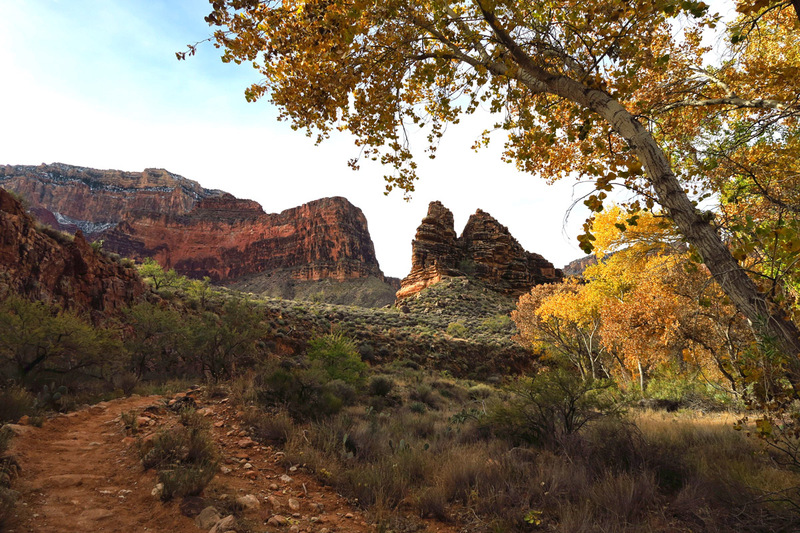 I have hiked the Bright Angel so many times that I know where each of your photos were taken. Funny story on one of our Rim to Rim to Rim we met a guy at the 1 1/2 mile rest house that said he was a server at the North Rim restaraunt. 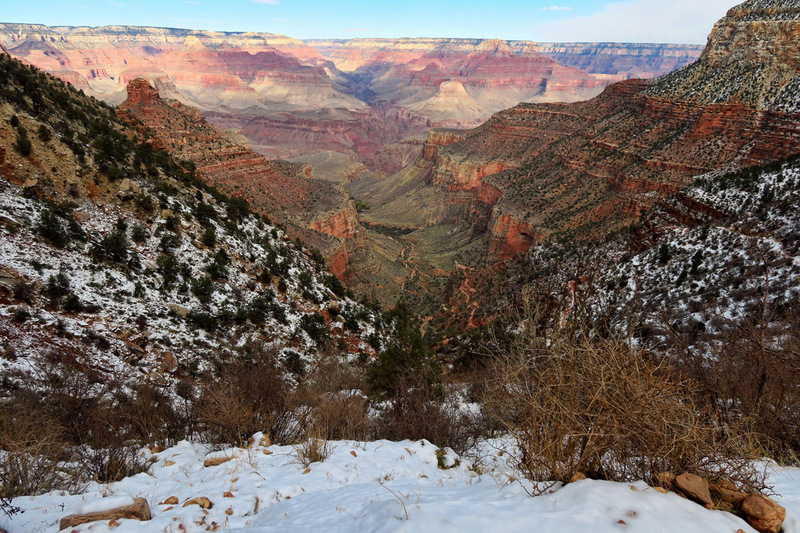 On a whim he decided to do the Rim to Rim and go to the South Rim and take the shuttle back. Said he slept in a wheel barrow down in the Devils Corkscrew (we saw it on a later hike). Yep and when we got back to the North Rim two days later and ate at the lodge there he was. Woman! You are such a stud. Excellent reporting. I am in awe! Your determination and perseverance are truly admirable. You set an ambitious goal and by golly you achieved it! Well done. Love your photos and narration. Thank you for taking me along on the journey. I really enjoyed it. Felt like I was on the trail with you, laughed out loud when the mule snorted! Such stunning views, sore feet would be a small price to pay. Thank you for sharing such an amazing journey! Its always exciting to start an adventure in the dark and watch the dawn. A great achievement and a privilege to experience these sights. I always appreciate the photographs you take because it does take time and stops the rhythm of your walking. Manys the time I have come back from a ride and wished I had taken photographs, you only get one chance to capture that specific moment. What an incredible experience and accomplishment. Your perseverance is quite admirable and so inspiring. Congratulations !!! This might be a silly question, but since cell signal isn’t always available, do you have a guide book or source of info you use in your travels and hikes ? Thanks again for sharing your travels so brilliantly. 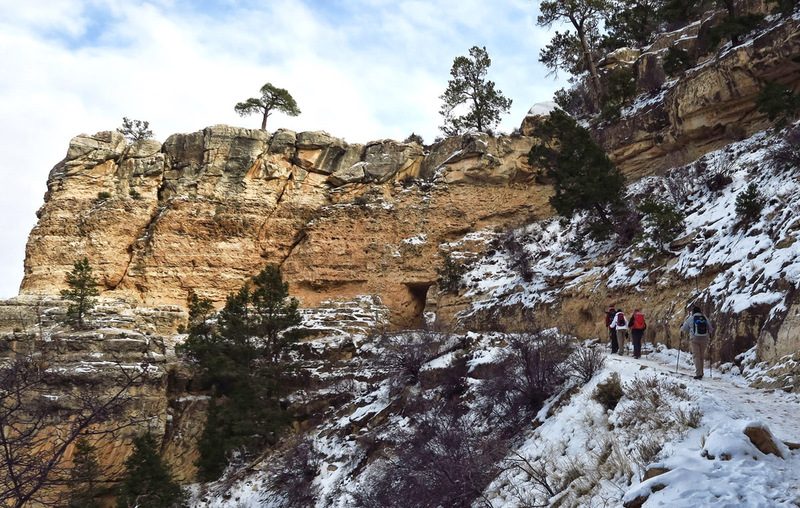 I love how you got to experience the transition from snow to desert to snow throughout this entire adventure! 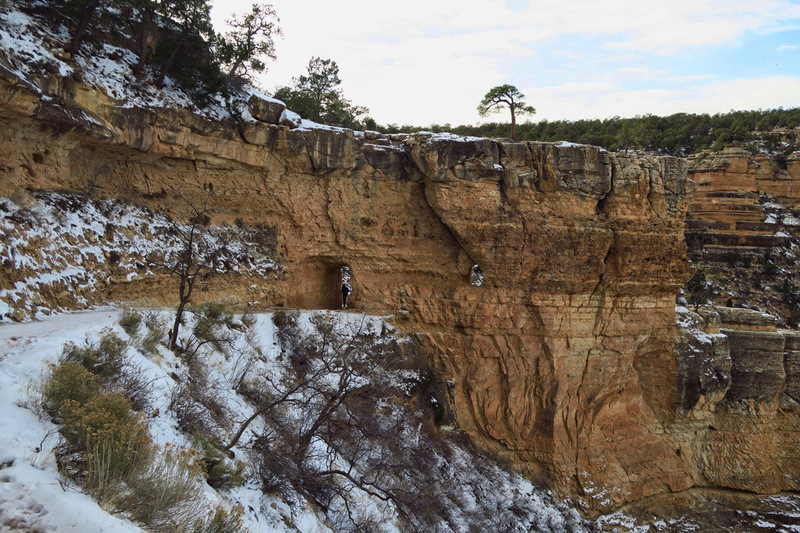 This is definitely one of those lifetime milestone experiences and while it is a shame that more people don’t go below the rim, it also means the interior of the canyon doesn’t get loved to death. 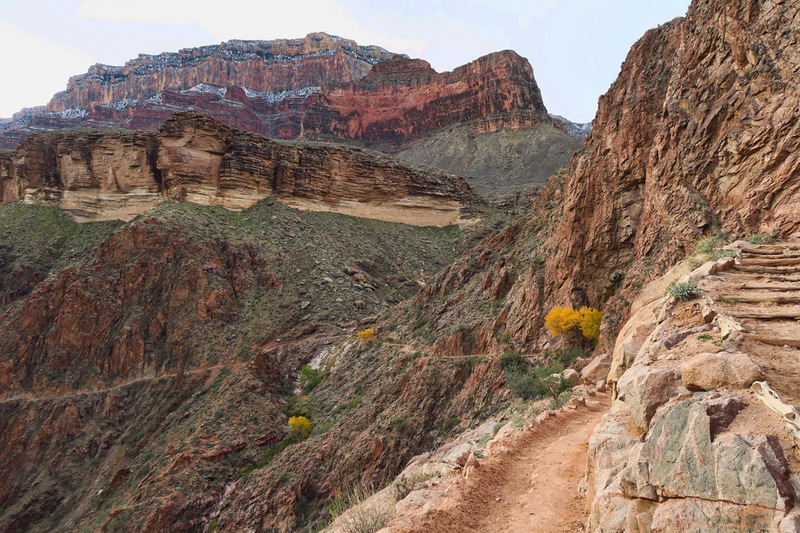 30 miles in 3 days in one of the most amazing places will stay with you forever! 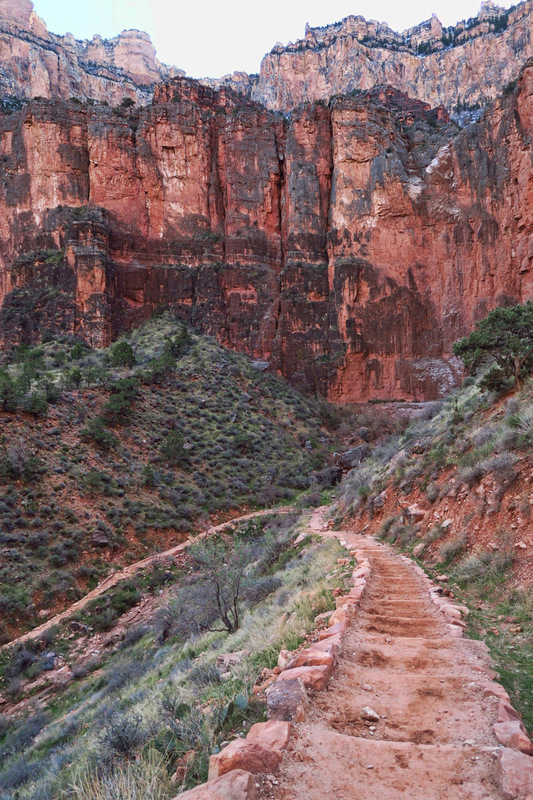 Your photos of going up the Bright Angel trail brought back memories. 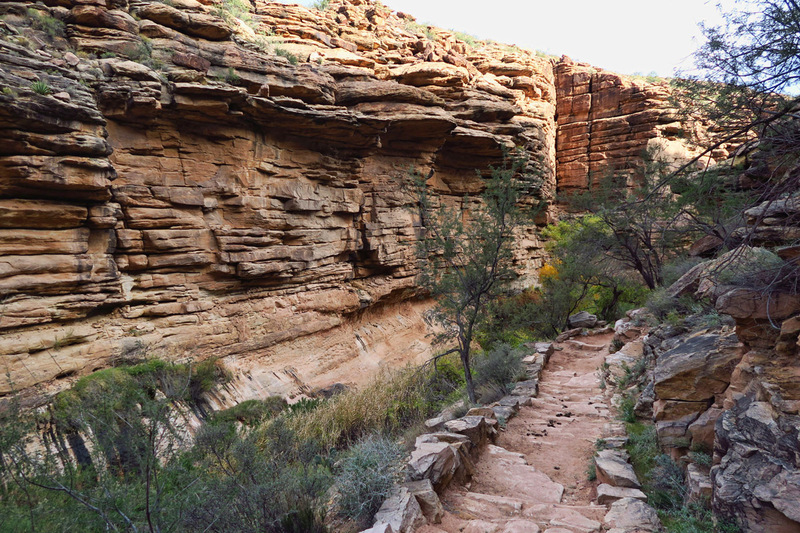 Your mention of hiking thru the geological layers made me think of Colin Fletchers book – “The Man Who Walked Through Time”. 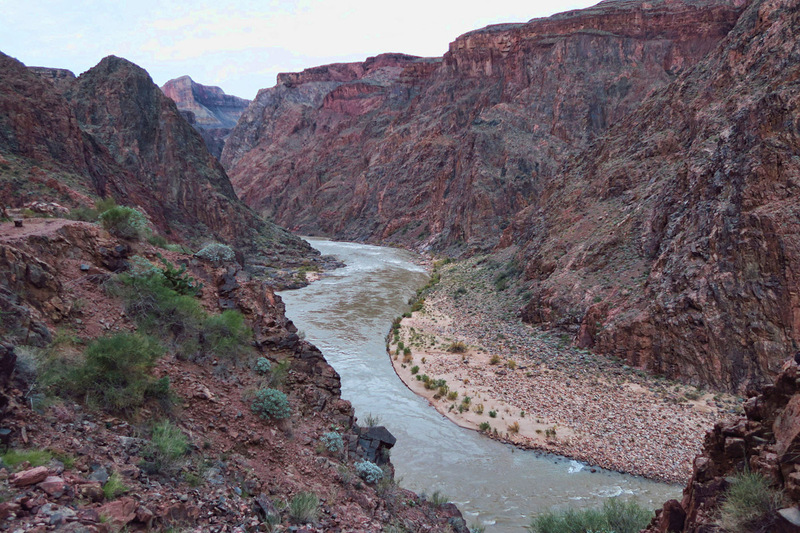 In 1968, Fletcher was the first person to do a continuous hike of the length of the canyon that lies within the National Park. He published his journey in that book. 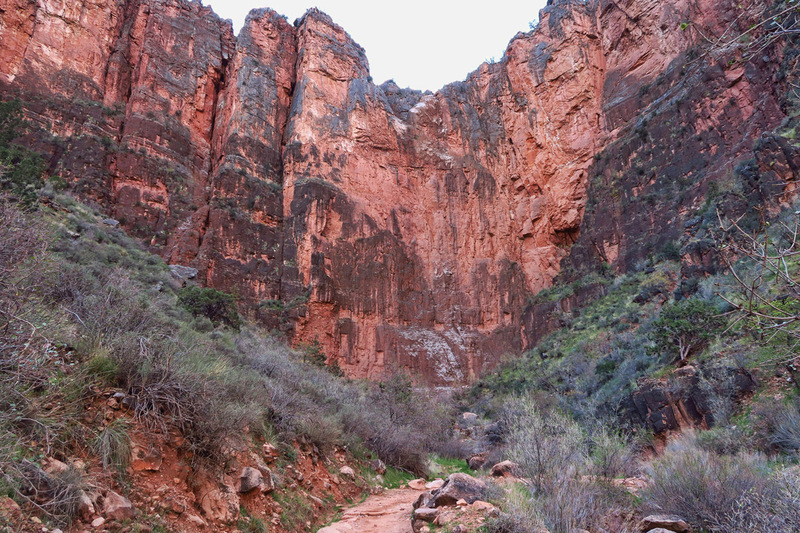 It’s a great read about hiking in the canyon. Congratulations Suzanne! Love the winter pictures. 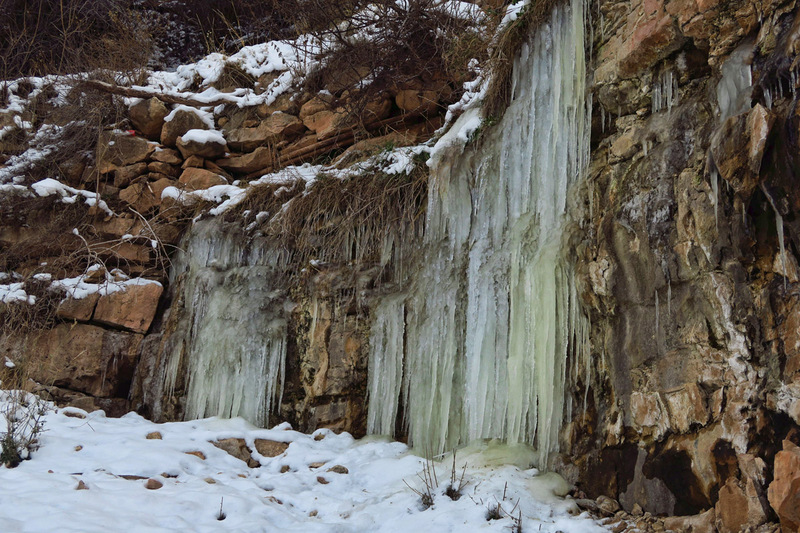 I was there this past summer and wondered what it would look like in the winter. Thanks for sharing and I too hope to do it some day. Suzan, We wish you a Merry Christmas and Happy New Year !!! P.S Your posts is excellent and very interesting to read ! What a feat! You should be so proud of yourself. 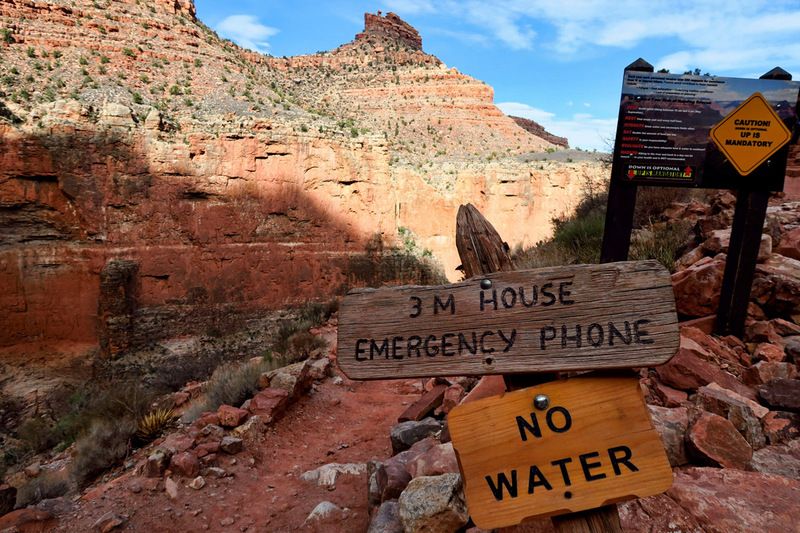 From now on there will be no hike too difficult for you. I am in awe of what you have accomplished!